Fruit trees are our garden companions for years and often decades. They need the best care we can give them and our rewards are the beautiful, nutritious foods they provide. 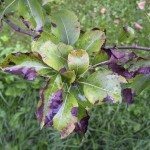 Fruit tree disorders like pear scab disease can rob our plants of their vitality and health. Pear scab control is possible and it affects both European and Asian pears. An annual program and careful management can minimize the damage from this common disease. Scab diseases affect many trees such as apples and pears. It is primarily a cosmetic fruit problem but some foliar and stem death does occur. Pear scab symptoms affect young growth, leaves and fruit. Some tips on how to treat pear scab can see your fruit blemish free and the rest of the tree in good health. The initial signs of pear scab disease on fruit are velvety, olive green to black round spots. The velvet disappears and the lesions mature and become corky. Infected fruit are stunted or malformed. In stems, new shoots exhibit the velvety spots but change to hard cankers. Tree leaves develop irregular lesions, often at the margins or rib. The lesions overwinter and produce conidida the following growing season. The conidida discharge spores during periods of warm, wet weather which starts the whole cycle anew. Scab lesions can develop in as little as 8 days after exposure on young plant material, while older leaves and stems may take months to show signs. Controlling pear scab without chemicals takes some vigilance. Since the inoculum lives in the diseased plant material, cleaning up dropped leaves in fall can help prevent the spread. Removing infected plant materials can also have some benefit. The fruit is often widely infected in storage. Be very careful during harvest to sequester any fruit that exhibits even the tiniest lesion. If even one gets into a storage crate, the rest of the harvest could get infected. Sanitation and good hygienic practices are the only offerings for pear scab control without spraying. Fungicide sprays need to be applied 2 to 5 times during the season, depending upon where the tree is growing. The most important spray is done just as the flowers become pink. This is usually followed every 10 to 14 days by successive spraying to eradicate all the spores. Lime sulfur sprays applied at the delayed dormant season (usually around February to the middle of March) can help prevent spores from activating. A combination of chemical and natural methods is the best method of controlling pear scab in regions with warm, wet weather during flowering and fruiting.